The Hispanic Association of Colleges and Universities is asking for your support in its end of the year campaign. HACU is committed to Hispanic success in education, from kindergarten through graduate school and into the work force of tomorrow. Select HACU when shopping on Amazon Smiles. 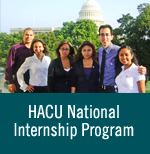 Donations help HACU continue its ongoing efforts of championing for education success. Click here for a video of Mike Flores, now chancellor of Alamo Colleges District, who shares his story of how he once participated in the HACU National Internship Program.